Extreame Savings Item! 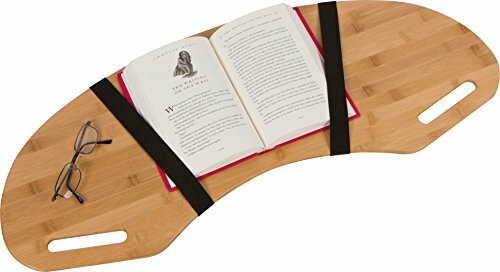 Save 45% on the Trademark Innovations 30.5'' Wood Curved Lap Desk Table Tray with Handles for Laptop by by Trademark Innovations at Andy Pemberton. MPN: LAPDSK-HNDL. Hurry! Limited time offer. Offer valid only while supplies last. This ergonomically shaped lap desk is perfect for a laptop or tablet. The curved shape allows you to come in close to your work without straining. This ergonomically shaped lap desk is perfect for a laptop or tablet. The curved shape allows you to come in close to your work without straining. Measures 30.5"L x 12.5"W and is a rich light wood color. Lightweight at 3lbs., the lap desk is portable and can go with you anywhere. Comes with 2 straps to hold items like phones, papers and pens in place and convenient built in handles. Designed to rest on the arms of a chair. Great for taking notes in meetings at the office without the need for a conference room. By Trademark Innovations.